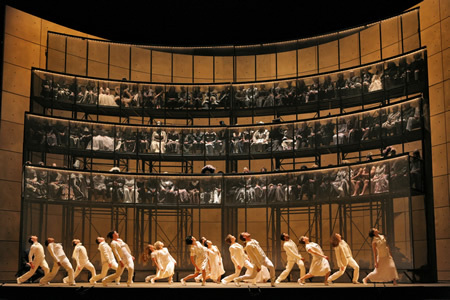 The Met’s new production of Orfeo ed Euridice, by Mark Morris, conducted by James Levine, is a stunning contemporization of Gluck’s opera from 1762. Allen Moyer designed the sets, which provided the framework for Morris’s beautiful, subtle staging and choreography. Countertenor David Daniels, clad in black, sang the role of Orfeo with a strong voice and magnetic presence. Heidi Grant Murphy, wearing preppy sportswear with wings, had the most fun as Amor, sailing in from the flyspace while singing. Euridice was sung with passion by Maija Kovalevska. A pair of curved metal structures serve as the main set elements; three shelves held the choristers. Each was dressed as a historical figure — the effect resembled the Galactic Senate in Star Wars. Not only was each singer visible as an individual, acoustically it functioned like a bandshell. Backing Daniels (who was onstage pretty much the whole 90 minutes without break) they silently gestured in canon to punctuate his stanzas. The effect was stunning, eerie and delicate, like fluttering batwings. Morris’ company plus four Met Opera Ballet members danced primarily in an oval area delineated by the curved set elements, which also held benches for them to sit on. The choreographer’s natural style allowed the dance sections to blend seamlessly in and out of the dramatic sections featuring Daniels singing. The dancers chasseed softly on bent legs, arms shaping curves, hands flat. Two lifted a third in lively group scenes. Later, they traced the edge of the stage apertures, alternating and repeating moves in a hypnotic line, and danced a rousing folk-influenced number near the end. Costumes (by Isaac Mizrahi) shifted from grey street clothes, to white, to multi-hued with sparkles, plus sneakers. A gleaming, many-storied staircase lowered onto the stage, allowing Daniels to descend in style. The underworld was believably ugly—an ore-like passageway that looked like a sleazy nightclub grotto, where Orfeo and Euridice hovered as they sang the most dramatic arias. Relief came as the amorous couple was liberated and the set revolved back to its first act iteration as Amor comically pushed the huge set. James F. Ingalls designed the lighting, which set the perfect tone for each scene. And as the Met’s chandeliers rise just before curtain to let us know the show’s about to begin, they lowered just before the opera ended — a nice gesture that released us out of the theater and back into our own lives.